Break out the bandwidth for the new Webby Person of the Year, awarded earlier this week to that audacious and elusive genius of graffiti, Banksy, whose month-long New York City “residency” in 2013, “Better Out Than In,” showcased the power of social media and its collaborative influence on the impact of art. For four weeks in October, the mysterious British artist kept enthralled followers guessing at the sites of his “guerilla” creations scattered around the city, via postings on Instagram, YouTube, and his own website. I’m more than late to the Banksy party, not having followed him at all closely, though he’s long been on the periphery of the radar for anyone interested in cultural matters. From afar, I would hear about his latest adventures and register a vague — and as it turns out, unjustified — sense of gimmickry. Now, delving more deeply into the Banksy experience, I come away hard-pressed to think of an iconoclast more perfectly suited to the times, a prodigious talent not afraid to break the rules — and the law, many would say — forging forward with the ultimate goal of making people think. 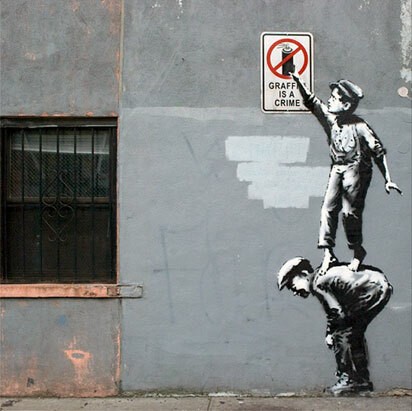 “The Street is in Play,” top, is in the signature stencil style and subversively Rockwellian. (It was vandalized in a matter of hours, par for the course in the transience of the Banksy terrain.) 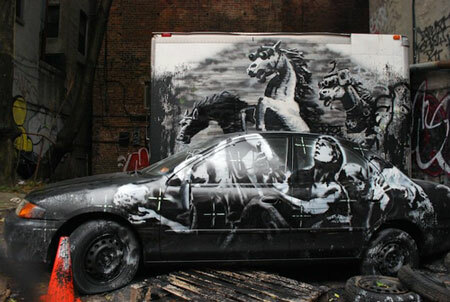 It stood in stylistic contrast to “Crazy Horses,” above, an Armageddon-like depiction, spray-painted on an automobile and the side of a truck found in NYC’s Lower East Side. Both highlight recurrent themes in Banksy’s work; the meta-like ability to juxtapose the unreal into a seamless narrative with reality, and, in the case of the latter, political commentary by way of the surrealism of war. To see where things can’t be seen; it’s what I captured most as I pored over the Banksy landscape. So maybe I’m not that smart after all.